Corrosion of reinforced concrete structures is caused by the process of carbonation and often through the contamination of concrete by sea salt and salts cast into the concrete. Corrosion Prevention of reinforced concrete structures is an increasingly important method of repairing and protecting spalling concrete, damaged bridges, steel framed buildings and other structures. Cathodic Protection is frequently specified as the primary solution for preserving reinforced concrete structures. Once installed and activated Cathodic Protection can significantly increase the lifespan of a structure. It can also be applied to protect new structures. By applying corrosion prevention techniques from the outset you can ensure the problem does not occur in the first place. Cathodic Protection works by making the encased metal surface the cathode of an electrochemical cell. A simple method of protection connects the metal to be protected to a more easily corroded “sacrificial metal” to act as the anode. This is demonstrated in the image below. Testing of concrete to ascertain reason for corrosion as per BS EN 1504. Site set up and hammer testing of surfaces to be repaired. Hydrodemolition of defective concrete from agreed areas. Quantifying and replacement of rebar. 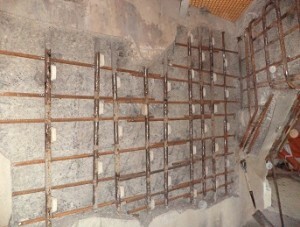 Inspection of anodes and replacement of rebar. Application of new concrete to profile. Cathodic Protection offers a technically sound solution because it deals with the corrosion problem across the entire area treated. This cannot be achieved with conventional repair methods without removing all the concrete where salt or carbon dioxide has penetrated. Such extensive repair is frequently prohibitive in terms of practicality and cost. For information and advice about your cathodic protection requirements call us on 0191 410 3444. CSC Services provide refurbishment services and protective coatings to structures across the UK water sector, in nuclear power stations, public sector buildings such as hospitals and prison buildings, and across UK infrastructure including bridges, tunnels, culverts and sewers. CSC Services installed a Cathodic Protection System for EDF Energy at Hartlepool Power Station in July 2016 as shown in the image. This was to the corroded Drumscreen Chamber 3. A further cathodic protection system was installed to corroded Drumscreen chamber 1 in January 2018 for EDF Energy’s contract partner Cape. 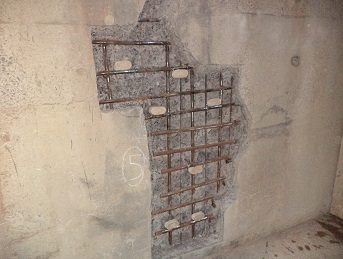 Corrosion of the reinforced concrete structure had been caused by carbonation and contamination of concrete by sea salt which passes through the Drumscreen Chamber as part of the Power Station’s cooling process. Following consultation with EDF Energy Engineers a site inspection was undertaken to examine the extent of corrosion, according to BS EN 1504 standards. A Cathodic Protection system was then installed during the summer shutdown period.